Having shown our readers in February Path the counterfeit presentment of H. P. Blavatsky, to whom the Theosophical Society owes its origin, we wish them this month to see the Headquarters of the Society in India as they now appear,unless lately changed. When H.P.B. and Col. Olcott began work in India, they occupied a bungalow in Bombay, on India’s western shore in u suburb of the city called Girgaun1. The present Headquarters are on the eastern shore in a suburb of Madras called Adyar, so named from the Adyar river—or the river from it. This river is a small one, frequently closed by the sand washed up from the ocean. It runs past the building, washes, indeed, the base of the wide piazza at the back. The building is made of brick and plaster, painted white, except some rooms erected upon the roof. There is a central hall paved with marble squares black and white. The offices were in the back from where good light and air could be had. Since 1884 Considerable changes have been made. The former porte cochere was done away with by the building of additions on each side, so that now there is a straight front with the pillars of the old porte forming the entrance. 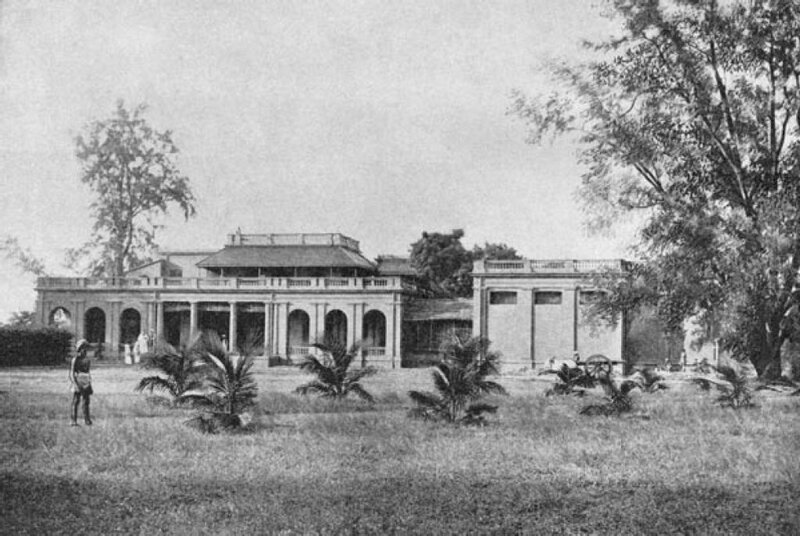 Another building upon the same front line was added on the ocean end of the main building, and is used for the Oriental Library. The grounds comprise about twenty-one acres, bounded in front of the house by a large grove of trees, on the back by the river, and on one side by the main road leading out of Madras. The view from the front is not interesting, as whatever might be seen is hidden by the grove of trees. There are numerous mango trees in the compound between the house and the main road, and these afford a grateful shade, their spreading branches covering great distances around their trunks. In the picture Col. H. S. Olcott, dressed in a long white coat or robe, can be seen standing at one end.